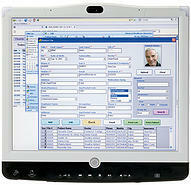 WITH THE MEDIP PLATFORM, CLINICAL RECORDS HELD UNDER THE ARM ARE RELEGATED TO THE PAST. Hospitals immersed in clinical history digitalisation face a new challenge: What's the best tool for managing and consulting all the information they have? With our years of experience and our in-depth knowledge of IP technology, we created Medip, a new tool designed exclusively for hospitals and health centres, capable of improving work flows in healthcare while increasing the quality of life of hospitalised patients. A SMARTER HEALTHCARE SYSTEM STARTS WITH BETTER INTERCONNECTIVITY. 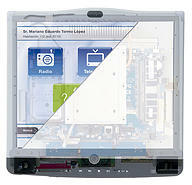 The visible side of this application is a touchscreen for hospital environments – hermetically sealed, anti-bacterial, with a card reader, ensuring total data privacy. Inside is a powerful, silent computer, capable of managing clinical records from the bedside in real time, with no paper and pencil, avoiding data transcription and enabling physicians to diagnose and take decisions more quickly and safely. This is the milestone that is changing the way hospitals work forever. REVOLUTIONISING IMPROVED CARE WHILE GENERATING UNPRECEDENTED COST SAVINGS. The ability to consult and process patient data, manage medication, consult analytics, view x-rays and change medication with a fingertip is a total revolution in improved healthcare, generating cost savings that are unprecedented in the sector. 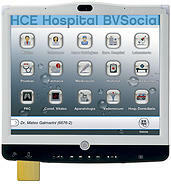 And in addition to this, the system can be integrated with a webcam that enables other functions such as communications with nursing staff and patient, visual control from the nursing station or communication with and attention from the doctor anywhere in the ward, the hospital or even anywhere on the planet. 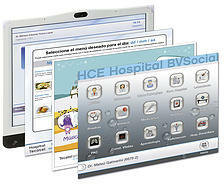 Wifi and Blutooth technology enables the tactile terminal to operate as a secondary monitor for a medical team, as an example, or for diagnostic imaging, vital sign monitoring and registration in the clinical records or communication to the nursing station. Medip Health is cordlessly synchronised with all medical devices. 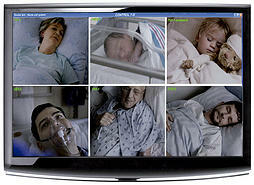 Medip Health's wide bandwidth and advanced technology give it an incredible response capacity. 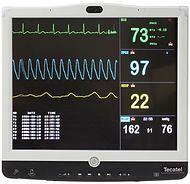 For monitoring and controlling patients who need ongoing attention, such as neonatology, ICUs, home care, etc. The touchscreen is designed with high-resolution TFT technology, giving it a well-lit, non-reflecting, exact and clear readout anywhere. Patient data protection is ensured at all times. Access to clinical records is restricted to medical staff.